Jumpsuit has zip fastener.Headpiece has velcro fastening. 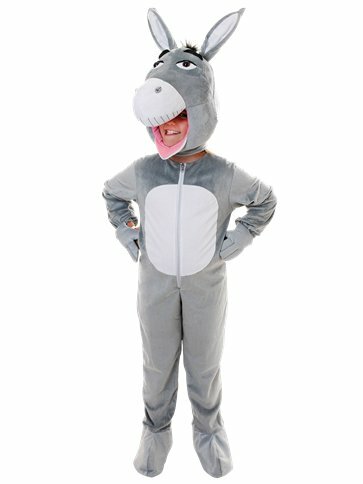 This Big Head Donkey Costume features an easy to wear soft fur, grey jumpsuit with a white, fur tummy panel and full zip fastener to front, along with hand covers and shoe covers held securely in place with elastic straps. The donkey outfit is completed with an oversized, padded, character headpiece with velcro fastening to back, poseable ears, bright eyes and a cute, little tuft of black fur between the ears. Want it Friday, 26 April? Order it within 16hrs and 3mins and choose Premium by 9pm Delivery at checkout.